Andrew: Hello readers! 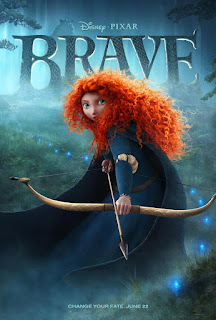 Last night Sarah and I went to the theatre down the street and caught Disney/Pixar’s new film, Brave, which is the first Pixar film to feature a female character in the lead role. The film is about the young Scottish princess, Merida, whose parents are trying to betroth her to one of three suitors from neighboring clans, and she ain’t having it. Sarah, we talked about this on Thursday in our preview and you were looking forward to it. So now that we’ve had a night to sleep on it, what are your thoughts on Brave? Sarah: I liked it! I thought that it was sweet and innocent and really was just a fun movie to see. It was BEAUTIFULLY made, which is to be expected from Pixar. The animation was absolutely gorgeous. What did you think? A: In all honesty I was disappointed. I was really looking forward to seeing it because they hadn’t given away much of what it’s about in the trailers and promotions, doing a good job of keeping what the movie is truly about under wraps, and what they kept under wraps wasn’t really all that special. Or at least it wasn’t anything that people who have seen other Disney movies haven’t seen before. The biggest strength of Pixar movies has been, and seems to always will be, their storytelling. Whether it be the story of a clownfish being kidnapped and his dad’s quest to find him, or a bunch of toys who come to life when humans are away and what they’re lives are truly like. This one was probably one of the most simple and bland stories Pixar has done. Things happened simply to push the story forward, they didn’t happen organically. The first act was great, where they set up who Merida and her family are and when the suitors show up, but after that it just seemed like a sequence of events that HAD to happen for the progression of the story and that’s something you don’t normally see in a Pixar movie; and I was disappointed by that. S: See I would have to say that it was refreshing not to have a Pixar movie that really, for all intents and purposes, wasn’t too deep. It didn’t take a lot to follow the story and I thought it was a good thing because it wasn’t the norm for Pixar. I thought it was a refreshing change of pace. It focused more on the family unit rather than just a single main character. I thought the simplicity of it made it rather beautiful. 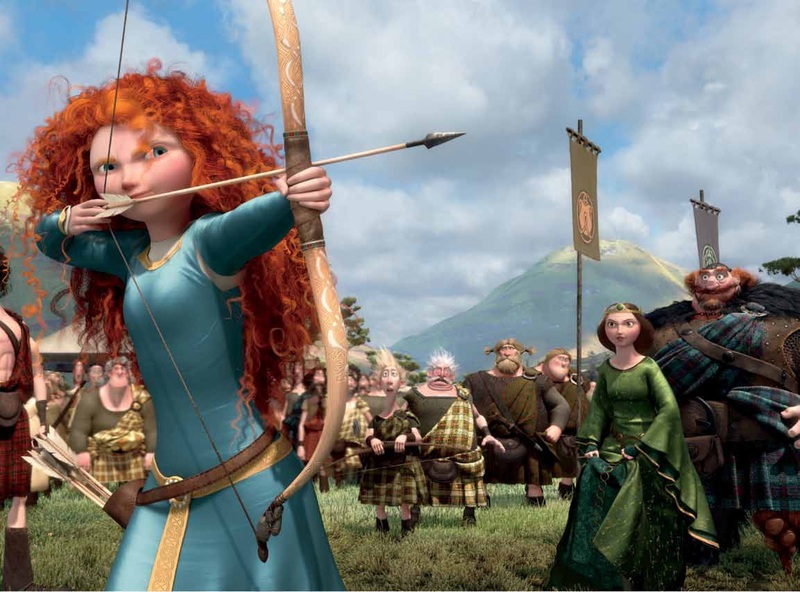 What did you think of Merida as the first female Pixar lead? A: I liked Merida, or I should say I liked her for most of the movie. I liked that she was this free spirit and really more of a daddy’s girl, in that she was definitely more like her father, King Fergus, who was my favorite part of the film. I liked her spirit, but then when the film got into what it’s really about she disappointed me. There’s a lesson that Merida needs to learn in the film (which is done in a really heavy-handed way) and she just DOES NOT get it. And for the longest time, too. I think that the simplicity is fine for kids, but for adults like us it was a little frustrating because we’re going “C’mon Merida, it’s not that hard.” That was my main thing with her. That’s what I was disappointed the most in with the film. For Merida to be such a strong character at the beginning of the film, being a great role model for little girls that will see this (as an aside, pair her up with Katniss from The Hunger Games and a ton of girls will want to learn archery now), I was disappointed in how she just couldn’t see the forest for the trees. S: Yeah, but you mentioned that the moral was a little heavy-handed and obvious TO US, but you have to remember that this is a kids movie first and foremost. It’s not meant for purely for adults. I understand most of the other Pixar films have been super entertaining FOR adults, but these are not primarily adult films. S: See, I’d argue that Cars 2 is more geared towards adults. The moral of Cars 2 would go right over kids’ heads. A: Well I’m not saying necessarily the moral but the actions and the comedy with Mater, they kind of pander to children in the Cars films. But like those two, Brave is more GEARED towards kids. You have the preternatural younger brothers, the triplets, who can move through the castle in sneaky ways and pop up here and there and are just very mischievous, and the clan leaders clan who are jokey and flash each other under their kilts. So there’s a lot of juvenile humor, which is fine because we laughed a lot, but I just think grading Brave up against all the other Pixar films, I was let down because I felt that this could have been done so much better storytelling-wise. But fair being fair, the animation might be the best of all the Pixar films. S: It rivals Finding Nemo in the vibrancy of the colors and visuals. A: Finding Nemo and Wall-E, I’d say. S: Yeah. BUT, there’s a difference between the two because this one looked much more realistic than any others. All the others still look like cartoons. A: We saw this in 3D and there were times where they showed a landscape shot and it seriously looked like it could have been film. A: The big bad bear that takes Fergus’ leg in the beginning looks real and is quite scary for a kid’s movie. But the hallways scenes in the castle where they only have a torch to light the way? It all just looked great. And obviously Merida’s hair, you could really just watch that the entire time and be transfixed. S: Yeah, that was a lot like Sully from Monster’s Inc., that detail where you can tell every hair had been drawn in. It was impressive. A: Agreed. And I want to point out I thought the voice-acting was great. Kelly Macdonald (Boardwalk Empire) was perfect as Merida. Obviously she’s Scottish in real life, so she was perfect. S: And they joked on GMA that they got every Scottish-born actor they could find to be in this movie. S: Kevin McKidd from Grey’s Anatomy was another of the clan leaders AND his son, and he uses a Northern Scottish dialect that’s actually a different language, and he does it so well that it’s very humorous. A: And Emma Thompson (Love, Actually) is great as the queen, Elinor, and Billy Connolly (The Boondock Saints) I really enjoyed as the king, especially the scene where he does an impression of Merida. That got a big laugh out of the theatre. So overall I liked Brave but I thought it could have been a lot better and was disappointed in it. It’s not that I didn’t dislike it, because there are plenty of things I do like about it, but I don’t think it will be a film that we will own. It’s certainly not up there on the same level for me as Toy Story 3 or The Incredibles. S: No it’s not. But I liked it, especially that its simplicity and storyline were sweet. A: And it’s definitely a mother-daughter film. S: It really is. And I think it’s more closely aligned with the other “Disney Princess” movies rather than the other Pixar films. So, you know, I’d say that it’s much more child-focused and more girl-focused, but I liked it. No I don’t think it’s one that we’ll own, but I thought it was fun and beautiful in 3D. So if you’re going to see it in theatres, see it in 3D. A: Not that it has to be seen in 3D, I’m sure it looks great in 2D, too, but the 3D is amazing. 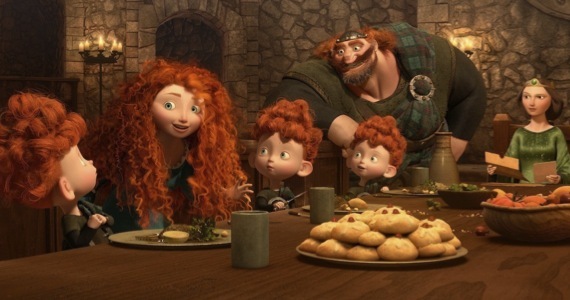 S: Right, but there are things in the 3D that would be lost in 2D, like the Wisps or Merida’s hair. A: Compared to other Pixar films it’s disappointing, but if you compare it to a Dreamworks film like How to Train Your Dragon or Shrek, it’s better. Maybe marginally better, but still better than some of those. S: And I would argue it being better than How To Train Your Dragon. A: Yeah, but compared to those films as opposed to other Pixar films, it’s as good as they are. S: It’s hard to judge this one because visually it blows all the others away. It’s the best-looking Pixar film yet.